There’s lots of offensive sets that Ultimate teams can use to run their offense. The horizontal stack (ho stack) is one of the more popular offenses used by new and experienced teams alike. In this post, I will lay out the basic principles of a ho stack and what types of teams can benefit most from using this offense. The horizontal stack consists of having three handlers positioned horizontally even with the position of the disc and four cutters upfield of the disc and placed horizontally across the field. Each cutter is assigned a vertical lane where they cut from and then cycle back to once their cut is complete. This set up creates large amounts of space for cutters to cut into either under the stack or behind the stack. These cutters are often numbered 1 thru 4 so that each cutter knows where they are supposed to be positioned. The basic idea behind a ho stack is that it puts each upfield defender on an island where they must attempt to defend cuts in both directions. The depth of the stack (how far upfield the stack is set) depends on the ability of the throwers and the weather conditions. Generally, starting the stack 15-20 yards upfield allows the cutter to be a threat to cut both under and deep. If the stack is 30-40 yards deep it creates more space under for larger gains but the cutters are too deep to be a credible threat to cut deep unless you have players who can throw 60-70 yards upfield. If it’s a windy day, the stack needs to be moved closer to the handlers, roughly 10-15 yards, so that cutters are still a threat to cut deep even into the wind. The offense flows when neighboring cutters work in tandem by making opposite cuts at the same time. If one cutter cuts under (toward the disc) the neighboring cutter should cut deep (away from the disc). This creates two lanes of available space under and deep that the cutter can use to get open. 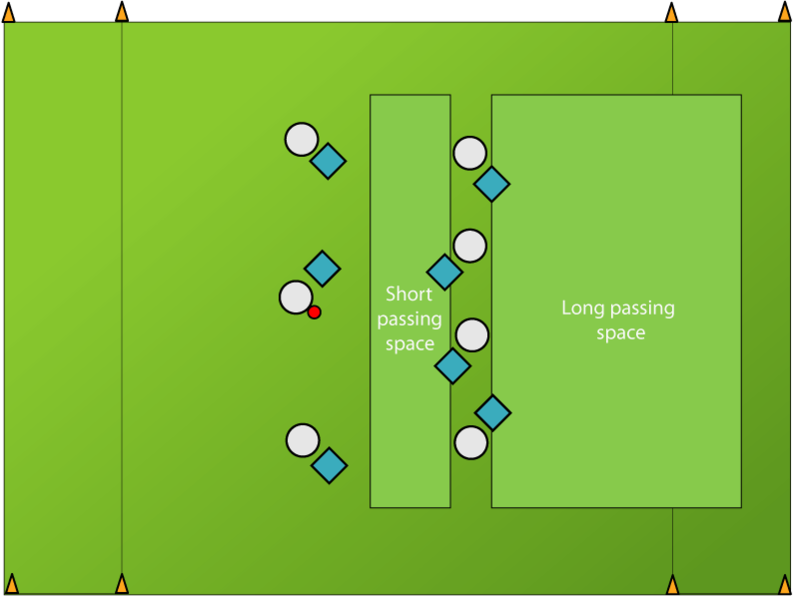 Once passes upfield began to be completed the stacks needs to continue to move upfield, maintaining the depth of the stack. This maintains the threat to cut under or deep throughout the flow of the offense. The flow of the offense is most efficient when neighboring cutters are doing opposite cuts. As one pass is completed to an under, the neighboring cutter who cut deep to create space, now has tons of space to cut back under for a big gain. The horizontal stack allows a lot of freedom for the upfield cutters. Once the motion of the cutters begins, usually initiated by an inside cutter (2 or 3), there is little structure to the offense. The offense is based mostly off of reading your teammates, which can be good or bad. If you are familiar with your teammates a natural and beautiful flow can be created as cutters create space for each other and the disc quickly moves upfield (occasionally without dumping back to a handler). If teammates are unfamiliar with each other (or even if you’ve played together for years), the lack of structure can lead to poor timing and double cuts, making the offense stagnate. This lack of structure can create missed opportunities for an offense if run poorly. If run correctly, the lack of structure can make it difficult for an opposing defense to figure out, making it more versatile than some other offensive sets. Is the Horizontal Stack Right for Your Team? To determine if the horizontal stack is the best offensive set for your team to run you must compare the challenges of the ho stack with the strengths of your team. Running ho stack means that at all times cutters are a threat to cut deep and to cut under, but cutters on the break side can become non-factors if the handlers are not able to move the disc horizontally across the field, also known as swinging the disc. If the disc only remains on the strong side, eventually the weak side defenders will know they can poach off their cutters and take away the valuable deep space behind the cutters. 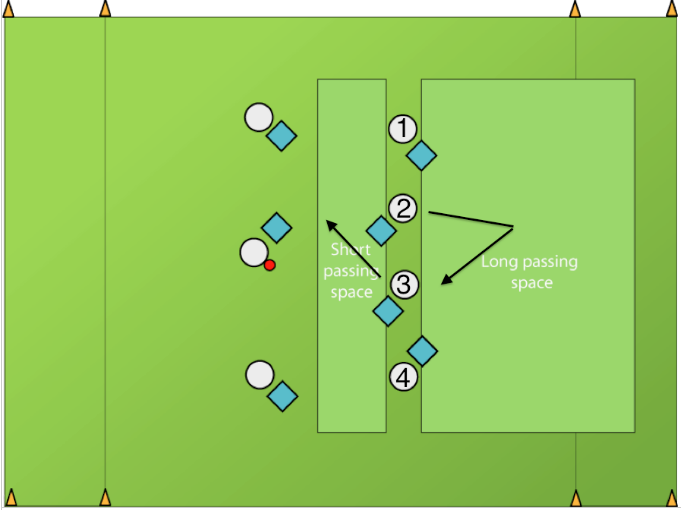 Also, by placing cutters horizontally across the field you reduce the number of throwing lanes available for throwers to make a deep pass, or a huck. This means that quite often a thrower must be able to throw around or over defenders in order to complete a throw into the open space behind the stack. This can be challenging for newer throwers. Without throwers that can handle these tasks, nearly all the work on the offense falls on the cutters to just plain get open. This can be difficult against a defense that knows what they’re doing. As a cutter in the ho stack much of what you do comes down to your awareness of what is happening around you. You need to be aware of what the cutters in the adjacent lanes are doing and what their defenders are doing. You need to be aware of where the disc is and what kind of throw the person with the disc can make at the time. After cutting, you need to make sure that your second cut or clear out doesn’t steal the space that your teammate is trying to cut into. Being aware of all the activity around you and processing it while working to get open yourself. Learning to cut in a ho stack begins very simple. Stay in your cutting lane. Cut the opposite direction of your neighbor. It’s quick to learn but hard to master. Cutters need a high level of awareness to play well in a ho stack, but at the same time running an offense with this much freedom helps cutters learn awareness and how to cut with their teammates. In the end, the ho stack, like many other offensive options, asks a lot of your team. You must look at the layout of your team and see if they mesh well with what is needed to succeed in any offensive set you decide on. If you are part of a college team that practices together often you can develop the kind of chemistry needed to dominate with a horizontal stack. If you’re throwing together a team for a weekend tournament it may be difficult to work with such little structure among new teammates. There are other popular offenses, which will be discussed here as well, which may work better for your team, but the ho stack is popular for a reason. It begins with tons of space for cutters and throwers to use and can be incredibly difficult to defend. The ho stack, like every other offense, is all about creating space and using it to your advantage.